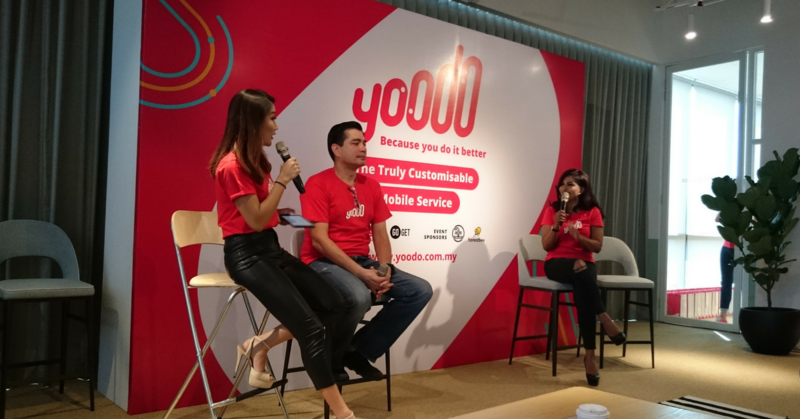 Yoodo is a new digital mobile service that aims to offer customisation to users. Everything can be done in-app, with the SIMs being delivered for free nationwide. There’s a new digital mobile service in town, and it’s called Yoodo. An independent service owned and operated by Celcom Axiata Berhad, the team appears to mostly consist of the target audience they’re trying to hit: the digitally-savvy millennials accustomed to customisation and the breakneck speed that technology can move at. With Yoodo, users can mix and match between what the company has calculated to be 1,000 possible combinations. This includes choosing how much data, voice calls, messaging and content you wish to have monthly. You can even choose to do without something like SMS (because let’s be real, most of us don’t need that nowadays). Once the plan has been chosen and you’ve created your account and added your payment details, you can choose to get the SIM delivered to you within 2 hours (in the Klang Valley) for a fee, or opt for a free delivery that will get the SIM to you in 1 to 3 business days. At the launch this morning, Farid Yunus, Head of Yoodo and the rest of his team had some insights to share about their development process that brought them to the product today. His first question to the audience: Who here is happy with their telco provider? He went on to explain that telcos in general struggle to adapt, particularly to the digital ages, thanks in part to the huge infrastructures built in the past that were designed in a specific way. When times and technology moved on, the telcos had difficulty keeping up. They also have the lofty mission of never having a customer call in to complain; to achieve that, they have customer relations teams and community managers in place to keep a ear on the ground and ensure that users are happy. With the amount of data breaches that have been making headlines locally and around the globe, security is definitely something to be concerned about. However, the team were quick to assert that their app has three levels of anti-fraud, which satisfies the local regulations for safety. After scanning the bar code on the SIM to be added to your account, you then have to scan your I.C. With OCR (Optical character recognition), the details on your I.C. will automatically be added to your account. After that comes the facial recognition step. Basically, take a selfie (but you’ll also be told to nod or shake your head to prove that it’s not just an image being uploaded). The name on your credit/debit card must also match the name on your I.C. Some of the steps you have to go through while signing up. The team weren’t too open about their plans for the next few months—citing worries about competitors taking their ideas—but they did make reassurances that they plan to update the app at least once monthly, with new features and improvements. As the data-heavy and custom-crazy millennials that are their target audience, we do see a service like this being very popular. In this age where we’re so used to getting things bespoke and made-to-order, it makes logical sense that our mobile plans are going to follow suit. 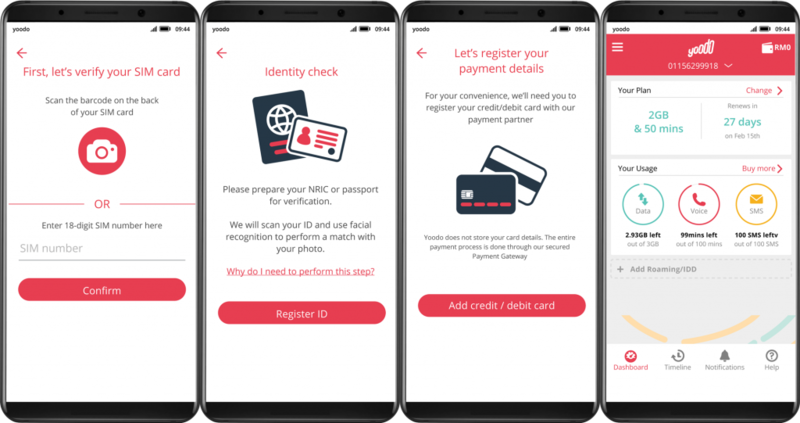 In terms of price-point, they’re competitive with what else is on offer, and there will definitely be adopters, as long as the Yoodo team keep to their assurances of quality service. Targeting 200,000 subscribers for 2018, they look to be having a good start towards hitting that goal. We look forward to seeing if other telcos will adopt similar models in response, and of course, bring more power to the user. Create and change your plan by selecting the amount of voice minutes, text messages and data you want each month. Sign up, activate your SIM and manage your accounts all on the app. SIMs can be delivered within 2 hours in the Klang Valley with premium delivery thanks to GoGet; basic free delivery is available nationwide. The SIMs can also be dropped off in mailboxes etc. ; no person needs to be present to receive the package. Monthly payments are auto-deducted from the registered credit or debit cards. Existing numbers can be ported over. At the moment, the domestic data quota can be used while roaming abroad (in 12 countries), and you don’t need a VPN running on your phone either. Yoodo is available on the Apple App Store and the Google Play Store.